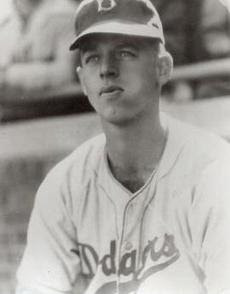 Cy Buker pitched for one season in his big league career for the Brooklyn Dodgers in 1945, the last year of World War II. Buker was drafted, but was soon released due to asthma. He pitched well for the Dodgers, going 7-2 with a 3.30 ERA in 45 games. Buker was a reliever and was one of "Durocher's Firemen." 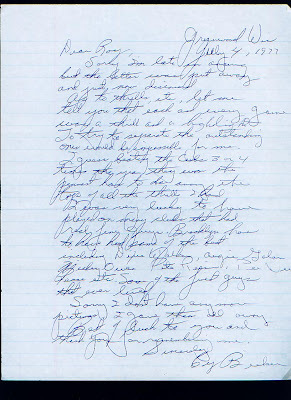 Below he writes Roy back about his thrills and highlights. As to thrills, etc., let me tell you that each and every game was a thrill and a highlight. To try to separate the outstanding one would be impossible for me. I guess beating the Cubs 3 or 4 times the year they won the pennant has to be among the tops of all the thrills I had. I was very lucky to have played on many clubs that had real fine guys. Brooklyn had to have had some of the best; including Dixie Walker, Augie Galan, Mickey Owen, Pete Reiser, Pee Wee Reese, etc. Some of the finest guys that ever lived. Before arriving in Chicago to play the Cubs, the Dodgers received a scare when the train with the team's Pullman coach caught on fire. "We were on the train from St. Louis to Chicago. Around 5:00 a.m. with train traveling about 80 miles per hour, we hit a gasoline tanker truck. The explosion killed the engineer, fireman, and brakeman and the truck driver. We were riding in a Pullman car sitting up. We couldn't get a sleeper with all the troops coming back home. It was quite a jolt to wake up and see flames all around the car. Since the cars were mostly steel, the flames went out in a short time. We had a double-header in Chicago, and I had to work one of the games." That's some pretty scary stuff. The nicest thing about collector message boards is that everyone wants to share a new find and/or recent purchase. Collectors will put up pics so that others can get a glimpse at something the community has yet to ever see. Not only that, oftentimes collectors will ask the community for some help in identifying some aspect of an item. This past week, such an item popped up that I thought readers of this blog might enjoy. 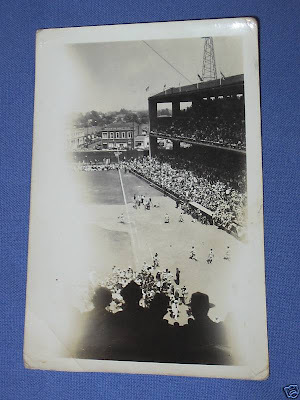 First of all, a big thanks to Steve F for agreeing to allow me to show his recent purchase of 1940's era fan photographs of old Wrigley Field in Los Angeles. They were originally posted at the net54Baseball site. These photos are fascinating since they are so different from what you might expect. 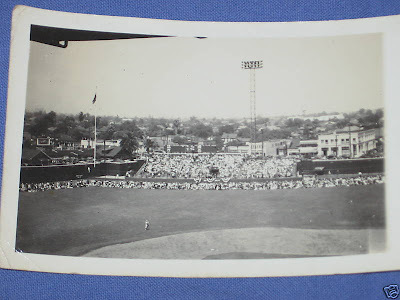 For instance, in the photo above why are there spectators sitting on the outfield grass? This must be of some promotional event because there is only one outfielder playing a very short center field, or maybe this is just a pre-game ritual. 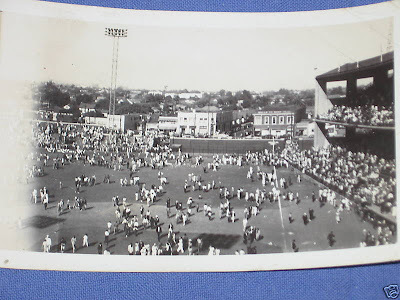 In the above photo the crowd swarms the field after, what must have been, an important game. Then below, a camera crew can be seen just past the 1st base line. Was this a film shoot? After all, numerous shows and movies were filmed here; like Home Run Derby and Damn Yankees. Maybe this was a playoff game. If you have any insight about the events taking place in these photos please pass them along. I know Steve F would appreciate your input. Also, please check some of my other pics from Wrigley Field in LA here.